Next week, the sequel to J.J. Abrams’ surprising reboot of Star Trek will certainly draw huge audiences. Given the resurgence of this franchise, it feels silly to admit that I was very skeptical of the 2009 film that went back to the origin story of the Enterprise crew. Before we’re exposed to scenery chewing from the wonderful Benedict Cumberbatch, let’s go back and look at my favorites from the long-running series. There have been tremendous changes from the original TV series created by Gene Roddenberry. The subsequent films with that cast ramped up the special effects and humor, yet they seem small-scale compared to the new blockbusters. Even so, there’s a definite charm to the work from William Shatner, Leonard Nimoy, and the entire group that started it all. None of these choices will be shocking. This is a case where the conventional wisdom is pretty accurate and has correctly identified the stinkers. If you’re curious about my complete Star Trek rankings, you can check it out on Letterboxd through this link. Live long and prosper, my friends. 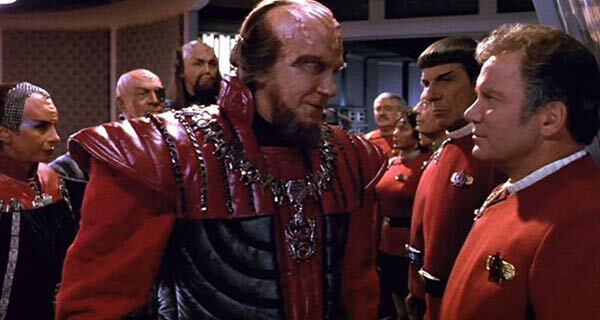 The obvious Cold War allegory of the peace talks with the Klingons feels clunky today, but there’s still plenty to like with the final outing for the original crew. Nicolas Meyer returns and brings a graceful touch that was missing from its serious predecessor The Final Frontier. Christopher Plummer has loads of fun playing the villainous Chang, who quotes Shakespeare while trying to shoot down the Enterprise. Everyone is showing their age, but we know the characters so well that we love spending time with them. The adventure gets rolling in the second hour and provides a sharp conclusion for the first group of movies. It’s a sweet exit marred by the unfortunate send-off for Kirk in Generations three years later. It’s easy to charge Abrams’ vision of Star Trek with being too different, and I can see that point. Even so, there’s so much to like in this energetic movie that I can forget those concerns. Chris Pine and Zachary Quinto channel Shatner and Nimoy without doing impressions. They make the characters their own while still doing justice to the originals. Nimoy’s appearance is not stunt casting and plays a key role in the story’s success. The entire main cast does a good job, and Abrams brings a vitality that was missing from the final two TNG movies. Can the sequel possibly live up to this high level? I have my doubts, but there’s always a chance with such a skilled group working to keep the magic alive. Easily the best of the TNG films, First Contact brings that crew into an all-out battle with the Borg. 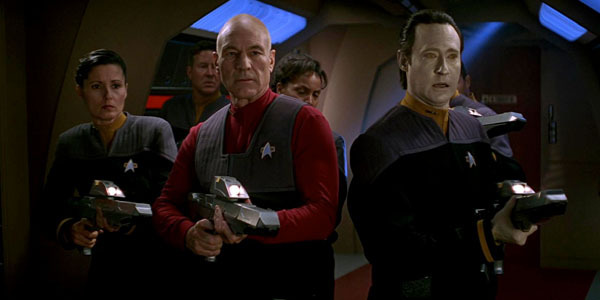 The battle ends up happening back in time, which is a common trope in the Star Trek universe. The stakes feel so much higher this time, and Patrick Stewart really gives his all as Picard. His experiences with the Borg during the TV series play a big role in his feelings towards that nearly unstoppable enemy. James Cromwell and Alfre Woodard slide in nicely as guest stars and bring life to the more stoic crew. It’s an action-packed affair and a lot of fun, and they don’t waste the chance to show off such classic villains. Choosing between the top two choices was difficult. After the more emotional third chapter and Spock’s return, the series shift gears and has fun sending the gang to 1980s San Francisco. There’s a lot of silliness in this entry, including a goofball premise of saving humpback whales. Who knew that Spock was such a good straight man? Up until the Abrams reboot, this was the most accessible Star Trek film. There are no crazy aliens with bad make-up, little space flight, and just a few examples of techno-babble. Instead, it forces the group to navigate through a strange world and figure out how to save the world of the future. It’s endlessly re-watchable and glides through its two hours without any letdown. It was a close call, but the top pick had to be Nicolas Meyer's thrilling sequel to the bloated first feature. Working from an $11 million budget that was one-third of the previous movie, he delivers a tense battle of wills between Kirk and Khan. The comparison to a submarine battle is accurate and shows the broad possibilities of this universe. Without this success, the franchise might have died and never produced all the films and TV series. There are fewer visual effects, but that takes nothing away from the excitement. Shatner has never been better as Kirk, and Ricardo Montalban finds the right mix of cheesiness and menace as the villain. More than 30 years later, it still packs a punch, especially in the emotional final scenes. If you've missed out on the early movies, see this one as soon as possible. I'd love to hear your thoughts about this Star Trek list. Did I miss the brilliance of The Final Frontier? You should also check out my past Top 5 Lists if you've missed them. Honorable Mentions should go to Generations and First Contact. Say, have you seen the movie Free Enterprise w/ William Shatner as himself? It's a funny film about two Star Trek fans who are dealing with age and such while meeting their idol. There's a very hilarious moment when one of the protagonists as a kid talks to the imaginary William Shatner about fighting. Shatner's response is just classic. I do like Star Trek III and would have it at #6 if I expanded the list. It was right there for sure, so I can't argue with that choice. @thevoid99 - agreed, STIII (the most underrated Star Trek film, IMHO) needs to be in a Top 5 list. Its so great. Frankly, I've always thought of 2, 3 and 4 as one film. They're vastly different tonally, but they just work together. You're right that 2, 3, and 4 do function as a trilogy of sorts. The first two both deal with the Genesis project, and IV (while tonally different) still connects to the previous movies. 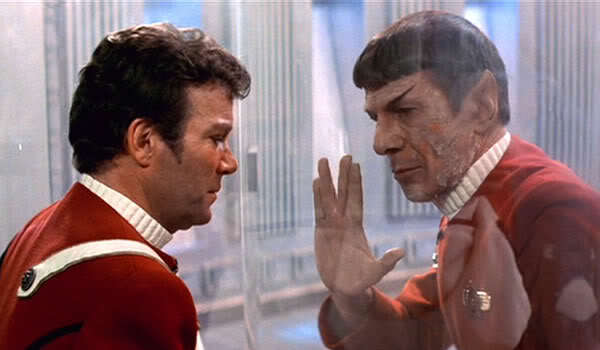 Spock isn't exactly who he was originally, and it's a cool connection across the movies. I don't have any issue with III being on the lists. It's #6 for me. I think I'd pick them in exactly this order, or very close to this order. In any event, I'd pick the same five. Steve, I figured this wouldn't be very controversial. My only questions were between 1 & 2 and 3 & 4, but I think my list is the right way. Sorry, but I'm one of the people who doesn't consider the reboot to be a Star Trek film, the title notwithstanding. They took everything that was good and right about Star Trek, brought it all together...and threw it in the trash to make a big, dumb, loud summer action movie. Now don't get me wrong, big dumb loud summer action movies can be very entertaining, and this one was. It just wasn't remotely a Star Trek movie. Unfortunately, I just read an article that stated that the studio, in order to appeal more to overseas markets, had found that the least liked parts of the reboot were all the talking on the bridge, and the backstories of the characters, so they are going to try to eliminate those as much as possible and replace them with scenes that the overseas markets do want to see, such as battles. Chip, I see your point about the reboot. I feel like even though it was different, there was still enough at the core of the story to make it a Star Trek film. That said, if what you're saying fits with the sequel, this may not be the case going forward. It's a tricky thing to evaluate because they're playing for such higher stakes now. Star Trek II had a pretty low budget, even by the standards of 1982. The new one has a reported $185 million cost, which doesn't include all the marketing. They're working in a different sphere these days. That isn't an excuse, and it actually supports your comments about it not being the same franchise. I'm hoping the new one lives up to expectations, but I'm trying not to get too excited until I see it. Chip, this is unfortunate and obviously not what a Star Trek fan wants to hear. I do understand their thinking, at least. With their budget at nearly $200 million, they're hedging their bets. Just being a modest success isn't enough when that type of investment is involved. What would GOD... ... ... needwithatopfivelist? Fogs, it's still weird to remember that The Final Frontier followed The Voyage Home. Such a crazy transition! Thanks and congrats on the LAMMY wins! I "blame" Shatner. That was his directorial effort in the series. LOL :D I still love it in a guilty pleasure sort of way though. I'll admit that there's a certain goofy charm in watching the cast go out of the comfort zones of their characters. I agree that Shatner may not have helped, though. I like the guy, but the mountain-climbing scene is just ridiculous. Hmmm ... In light of your #1, can't wait to hear your impression of Star Trek Into Darkness. I'm curious to see it, especially now that I know the villain's name (no big surprise!). It may be a few weeks, though. It's tough to hit the theaters with a two-month-old baby!